Looking to rip your sleeves the next time you throw on a polo shirt? Blast your biceps with a new twist on a classic move. 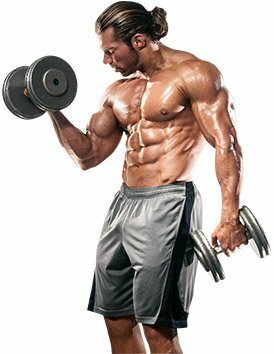 If you're like most people who go to the gym, standing alternating dumbbell curls are likely one of the first exercises you tried at the gym in your pursuit of big arms. They're simple, effective, and the embarrassment factor—the possibility of doing them in a way that looks foolish—is relatively low. Like many movements, the key to getting the most out of this exercise is to keep your form as strict as possible. You don't want to be bending and twisting like those guys dodging the bullets in slow motion in "The Matrix." Your upper arm shouldn't budge while performing the arm curl; in fact, your elbow should be locked in place by your side. As you curl the weight, your hand should rotate out, an act called supination. If you're having difficulty turning your wrist up, you're going a little too heavy; it's time to set aside your ego and drop down to lighter weights. Having said all of that, there is a time and a place to cheat. The finishing move on biceps day will use both strict curls and what's called "cheat curls." What exactly is a cheat curl? A cheat curl is a standing curl done using a small amount of momentum, usually generated from the hips and/or front delts, in order to get past the sticking point. For the purpose of this finishing move, we'll be using this cheat technique as little as possible in order to complete the prescribed reps. However, if you find you're able to complete every rep with strict form, you either rested too long between sets or didn't go heavy enough. This finisher—done after all your other biceps moves—is not for the faint of heart or weak of mind. This finisher—done after all your other biceps moves—is not for the faint of heart or weak of mind. You'll be completing 75 reps of standing curls with relatively heavy weights—without resting. You'll be doing a classic dropset here. A dropset is one in which you do an exercise to failure, but instead of dropping the weight you quickly reduce the poundage to continue the set. Start with a weight that you can rep for five strict dumbbell curls. The fifth rep should be very difficult. As soon as you complete those reps, go down 5 pounds and complete five more reps.
Continue dropping the weight by 5 pounds and doing five reps until you've done five sets (i.e., 45x5, 40x5, 35x5, 30x5, 25x5). Here's the catch: You'll be doing three rounds of this—without resting between sets. While that may sound impossible, that's where the cheat curl comes in. Place all five pairs of dumbbells at your feet before you start. You don't want to be searching for the correct weights after you finish a set. That's wasting precious time. On the first round, you should be able to complete all 25 reps with strict form. That means keeping your upper arms by your sides throughout—bringing them forward engages the front delt—with no discernible body swing. If you can't do 25 reps, you've started off too heavy and should drop your weight down on the next round. As soon as you have completed your fifth set of five curls, immediately go back to the weight you started with and begin round two. You may find at this point you need to cheat a little to complete the heavier sets. As you drop down to more manageable weights, clean up your form and complete the curls as strictly as possible. Round three is where you'll really need to buckle down and be ready to push through the pain. At this point you've already done 50 curls, and you probably don't have much strength left. You may be tempted to start with a lighter weight here, but don't. You haven't come this far just to quit now. Get back to your top weight and keep it moving. You may find that you can't complete any reps with strict form, and that's to be expected. The complete workout, from start to finish, should look something like this: 45x5, 40x5, 35x5, 30x5, 25x5, 45x5, 40x5, 35x5, 30x5, 25x5, 45x5, 40x5, 35x5, 30x5, 25x5. Most guys want pipes that would make C.T. Fletcher curse in approval, but building them takes more than just curling the same pair of dumbbells over and over. Most arm workouts are frighteningly poorly designed. Let's fix the 4 most common training mistakes on arm day so you can achieve results so good they're scary.